(Read below the picture for my original review) But this post has been bugging me.. I wrote an AWFUL review, I knew that most of the girlies reading my blog have read this book so I seemed to write it as if everyone already knew what it was about, but that is not the case! So I wanted to share with you the premise of this book…..
Redeeming love is set in the 1800s and is centered around a young girl sold into prostitution at a very young age. A wonderful Godly man named Michael falls in love with her and sets out on a mission to love her, mend her broken spirit and show her God’s love. There are many ups & downs during this book as well as tons of romance and the characters will leave you wanting more! I stand by my feelings below but I want everyone to know this is a wonderful book and you should read it!!! 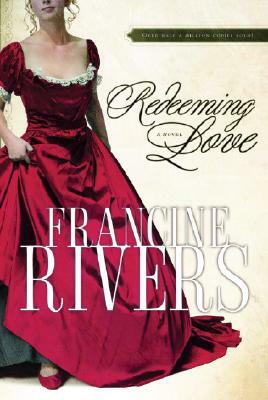 Redeeming Love by Francine Rivers…….. I finally read this book and I finally finished! And I am torn by how to write this review part of my review will be in sync with all my friends who have read the book and fallen in love with it and the other part of my review I may get hate mail for! ha! Although I enjoyed this book and the story line very much I felt that it tended to drag out, like I was always waiting for something more to happen or for things to catch up to “Angel”. I agree that Francine wanted to develop the story and for us to feel her heart warm up with time but I found myself not just taking the book in but reading it so I could get on to the next scene. I am in no way disappointed and I enjoyed myself but from what everyone had said it seems my expectations where set to high. And Paul, even in the end when Paul’s eyes were open to the real Angel I could not come around and like his character. He was awful in my opinion and people were too nice to him and I am still unsure if he truly was remorseful for all he did and said to Angel!! Things I loved about this book was the story line itself, of course I loved Michael Hosea and the world needs more men like him! I wish the last chapter would of been longer we waited the whole time for the “Happily ever after” and when we finally got it the book ended!!! This book was a shining example of how Christians should lead by example and how all things happen for a reason and I love that aspect! But would I rush to recommend it? Sure why not! I won’t be a hater…I’m just proud that read it and gave it a shot. We all like different books for different reasons.